Here's a fascinating post from Megan McArdle at the Atlantic for those that think there's a simple solution to control national health-care costs by controlling malpractice suits, end of life care, or any of the other usual suspects. 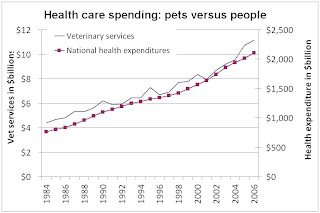 Turns out our spending on our pets is rising in lockstep with our spending on ourselves. (As it should.) Not to say there are not tons of problems that need addressing with health-care, because there are, just saying it will be neither as easy nor as successful as anyone claims. While I'm thinking about it, here's an example from Mankiw I saw the other day. Also, Mankiw noted it also, cool.